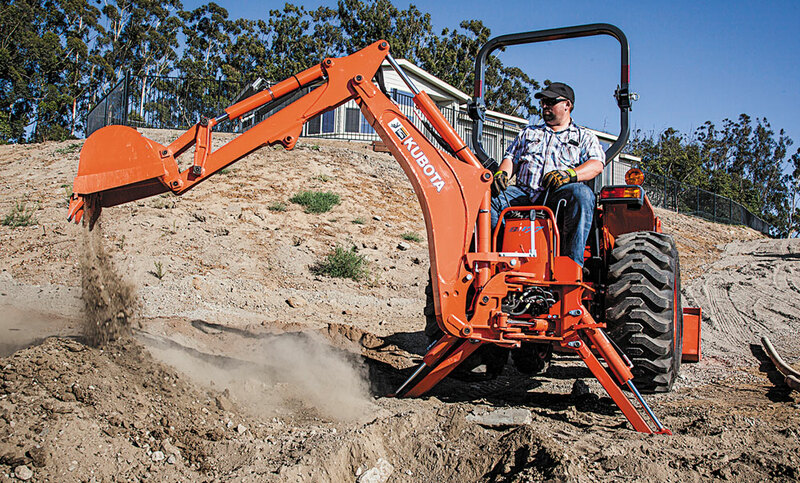 In this era of skid steers and track loaders, utility tractors might seem at risk of losing market share, but manufacturers are still confident. These PTO-powered tool carriers offer a unique type of diversity that certain customers (nurseries, hobby farmers, groundskeepers) feel still can’t be matched. Plenty of landscapers, industries and farmers with small-tractor tasks fully utilize the tractors in business operations, of course, but it is true that the machines are especially popular with property owners wanting to tidy the grounds. 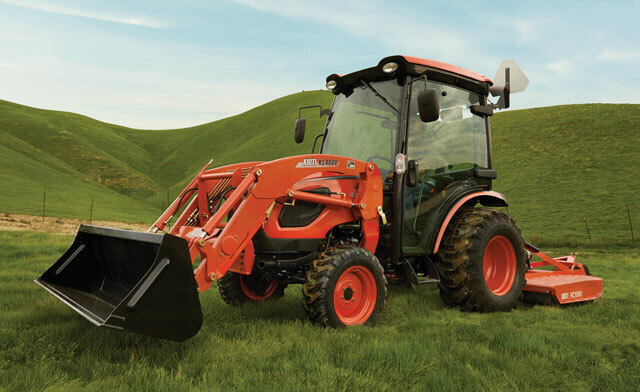 Kubota is an industry leader of compact tractors, and it’s L2501 is its biggest seller. The 25-hp, three-cylinder diesel machine comes in two- or four-wheel drive versions, has a 2,200-psi hydraulic system and weighs about 2,500 lbs. Of interest is that it has a geared transmission — eight forward and four reverse — and a clutch. That mechanical package might seem a little odd in this age of hydrostatic transmissions, but to some buyers a tractor isn’t a tractor unless it has a clutch and shift lever. “I’ve had a lot of conversations with people whose families once had a farm,” says Todd DeBock, North America product manager for 20- to 40-hp New Holland tractors. “They look at hydrostatic transmissions and decide they want a gear shift like they used to have when they were growing up.” That helps explain why 30 percent of New Holland compact tractors are sold with gear transmissions, but nostalgia isn’t the only appeal. DeBock acknowledges that gears can enhance a machine’s performance in some applications. New Holland offers several models in the 20- to 40-hp category, in both its Workmaster and Boomer series. One of its newest models is the Workmaster 25, introduced this spring. 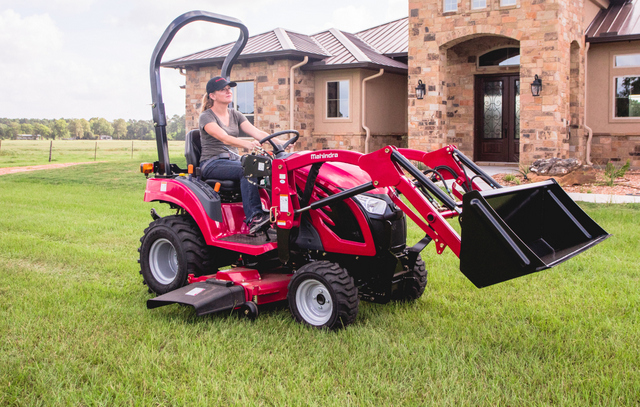 The 25-hp tractor has an appealing bundling of features, including the choice of either hydrostatic or gear transmissions, a fully independent rear PTO, a mid-PTO and a hydraulic system that can push 12.5 gpm of fluid and lift 1,600 lbs with its front-end loader. “The new value baseline for tractor shoppers has gone up considerably from what it was 20 years ago,” DeBock says. 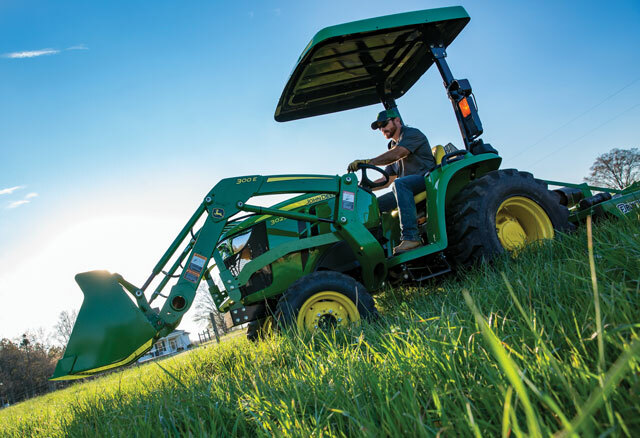 Schebler says Deere’s AutoConnect mid-mount mower deck, which can be driven over and attached without use of tools, “is a key differentiator for John Deere.” Deere’s Quik-Park front-end loader can be similarly attached or removed without tools. The 2032R and 2038R tractors also offer CommandCut, which lets a seated operator electronically and precisely set cutting height using dash controls. “Ease of use and attachability are among the most common pieces of feedback we hear when customers are shopping,” Schebler says. Mahindra entered the U.S. market in 1994 with a proven two-wheel drive tractor. Today it offers 46 models in the 20- to 40-hp range spread across four model series — eMAX, MAX, 1500 and 3500. They include two-wheel and four-wheel drive models, hydrostatic and gear-shift transmissions, open and cab models, industry-leading loader and three-point lift capacities and oversized tires. All that may not have been enough to set them apart from established tractor brands in this country, so Mahindra subsequently spent $30 million to develop what it calls its “hassle-free” mCRD engine family. Mahindra’s diesel engines meet emissions standards without requiring diesel particulate filters, which saves the operator time and the need for a regeneration process. “We are the only major manufacturer in North America that has no PDF on any tractor,” Franklin says. Two other advantages Franklin talks about are Mahindra’s standard seven-year warranty and, of all things, its seats. “We surveyed our dealers and customers and found one of the key things customers really notice is how comfortable a tractor seat is.” The company responded by introducing “mComfort” seats, which have additional cushioning and are more adjustable. Most utility tractor buyers have specific applications in mind and buy accordingly, which is to say they don’t subsequently gravitate to bigger tractors. “In general, when a customer decides to buy a compact utility tractor, he has done his research and purchases the right machine to meet his needs,” says Schebler at John Deere. This perception of compact utility tractors being “complete” in their versatility, reliability and affordability consistently brings buyers into manufacturers’ showrooms year after year. Even the skid steer boom didn’t turn the heads of such buyers. “The vast majority of customers likely would not replace their tractors with a skid steer or track loader,” says Schebler. Air Pressure: Check the tires for proper air pressure and wear on your utility tractor this spring. Proper air pressure is vital for the health of your tires and overall equipment performance. Accurate air pressure can maximize tractor efficiency, minimize compaction, increase tractor drivetrain life and increase profitability. If tires are not at the recommended level, fuel economy can be negatively affected and the overall life of the tires can be shortened with uneven wear. Be sure to check with your dealer or owner’s manual on recommended tire pressure for the task at hand. Replace the tires that are worn or show signs of dry rot. Belts and Fluids: Check and add engine coolant to your compact tractor this spring, and replace belts and hoses as needed. Look for fluid leaks and worn or cracked belts. Clasp each belt and move it so you can see the entire section of the belt, both the front and the back sides. Look for signs of cracking, fraying or splitting, oil soaking and hard glazed contact surface. Replace items showing any signs of damage. Read more about compact tractors here.